Discover the City on Foot! If you really want to feel the pulse of Budapest, explore it on thematic walking tours. Don’t think you know the Hungarian capital if you saw only the main attractions! These walking tours will reveal the city’s secrets, famous characters, architecture, art and history. Discover the city’s Jewish heritage on guided tours varying in length, go on special tours tailored to your needs and wishes, or plan your own walking tour for an exciting sightseeing program. So put on convenient shoes, and walk the streets of Budapest! Free Tours – Are They Good? Several agencies offer no-cost walk tours of the city lead by locals with in-depth knowledge of the sights, history, culture and traditions. Note: Although the tours are free it’s customary to give a tip at the end of the tour (cc. 1000-3000 HUF). These tours give pretty good general insight into Budapest’s history and you decide whether it’s worth a tip or not. besides the tour itself they answer your questions, give tips on what to do, buy or where to eat in Budapest. for max. 8 people, departs twice a day (excpet for the afternoon toor on 24 December, alld ay on 25 December and 01. January). at 10.30 and 14.30 from the lion fountain at Vörösmarty Square, downtown. interior visit of buildings is not included. Castle District (Matthias Church, Fishermen’s Bastion, the Royal Palace). The General Tour (also referred to as the Original Tour on their website) is for those who are visiting Budapest for the first time and don’t know much about the city, the Hungarian culture and people. For more exhaustive tours that relate the specific historic and architectural details of the city they offer tailor-made private tours for a fee. How Much Walking is Included? Are There Difficult Parts? The free Budapest tours by www.triptobudapest.hu are very popular and highly-rated on review websites (Tripadvisor). Some complained that due to the relatively high number of people present on the tour, they couldn’t here well what the guide had said. This quick stroll introduces to you the most notable sights along a circle in the heart of Pest in the V. district. Starting point: Széchenyi István Square – Pest bridgehead of Chain Bridge (Lánchíd). Getting there: tram 2 or 2A Széchenyi István tér stop, or a short walk from Vörösmarty tér (M1), or Deák tér metro stations (M1, M2, M3 lines). TIP: You can also discover downtown Budapest on a special small-group guided tour. Tours last approx. 3-4 hours and are available in several languages beside English. 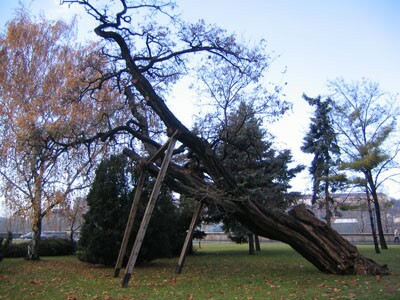 Széchenyi István Square has another relic that witnessed many events of Budapest’s history during its more than 150-year life; an acacia tree that’s said to be the oldest living tree in the city. The elegant Chain Bridge and the lions guarding the bridgehead dominate the view with Castle Hill looming over the Danube. Built between 1839-49 it was the first permanent bridge connecting Pest and Buda. You can read more about Chain Bridge’s history here. Standing in front of the bridgehead you can admire one of Budapest’s most scenic panorama with the Gellért Hill and the Statue of Liberty perching at its top to the left, and the Royal Palace and the graceful tower of Matthias church in Castle District on the opposite bank. To the north of the bridge the green Buda Hills enchants you to go for hiking, while the green Baroque towers of Church of St. Anne draw your eyes in Víziváros (Watertown). Liberty Bridge (Szabadság híd) to the left of Chain Bridge, Petőfi Bridge and the red Rákóczi Bridge (formerly Lágymányosi híd) further south. To the right the white and graceful structure of Elizabeth Bridge (Erzsébet híd) stretches over the river. 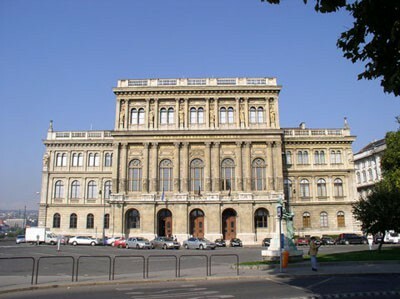 The neo-Renaissance building of the Hungarian Academy of Sciences encloses the square on the north. The stunning building on the eastern side of Széchenyi István Square is the Gresham Palace where the luxury Four Seasons Hotel welcomes its guests with lavish rooms. 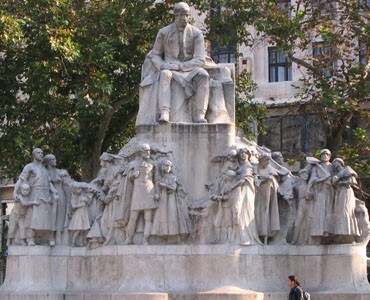 The standing form is Count István Széchenyi (1791-1860) whose idea was the Chain Bridge, also the founding of the Hungarian Academy of Sciences and numerous other development programs in the Reform Era in the 19th century. 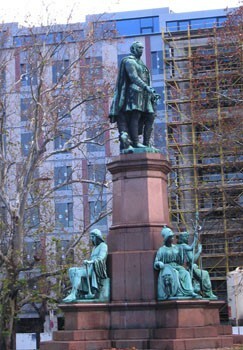 The other statue is of Ferenc Deák (1803-1876), another outstanding figure of the Reform period – often called “the Wise man of the Nation” – who facilitated and organized the compromise between Austria and Hungary in 1867. Heading south, you pass the statue of József Eötvös (1813-1871) writer and politician standing on the square of the same name. 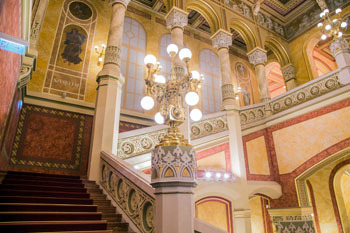 The off-white Romantic style building on Vigadó tér is the renewed Vigadó Hall, a premier concert hall of the city that opened on 15. March 2014 after years of renovation. It is open every day from 10.00 to 19.30. Drop by to see an exhibition, or enjoy the fine view from the terrace on the 6th floor. Walk straight ahead on Dorottya utca, and you’ll reach the heart of Pest, Vörösmarty Square. The plaza is the main square of the inner city. 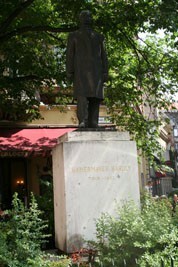 The white marble statue of the great Hungarian poet, Mihály Vörösmarty (1800-1855) writer of the Szózat stands in its middle. Szózat, a patriotic poem (Appeal) is often cited on public holidays and deemed to be the second national anthem of Hungary. 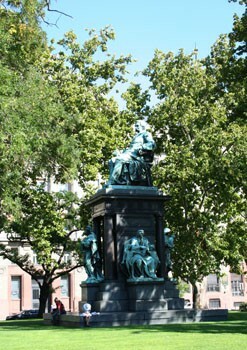 The opening line of the poem is carved into the pedestal of the composition: “Be faithful to your land forever, O Hungarians!”. Unfortunately the statue is covered in canvas in winter to protect it from corrosion. The Luxus Department Store on the eastern side of the square used to be one of the rare places in the communist era where you could buy quality clothes. Today a boutique store operates in its place. Take your time wandering around the square. 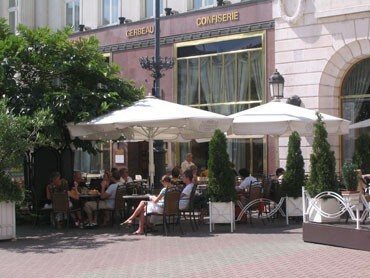 If you feel like taking a rest, and have a cup of coffee, pop in the famous Gerbeaud Cafe & Confectionery. Although being a very touristy area, the place is a bit pricey but it has very attractive rooms decorated with 19th-century furniture and artworks. In one of the rooms you can see a portrait of Emile Gerbeuad the Swiss confectioner who bought the place in 1884. The cakes and desserts are worth a try too. If you can find a place sit on the terrace in warm weather. The Millennium Underground (M1, yellow metro line) has its termini on the square, right in front of the Gerbeaud. If you pay attention you can hear the murmur of the trains while sipping your coffee in Gerbeaud. Budapest’s main Christmas Market takes place here, too. Around Christmas Váci street also dresses up in decorations and lights for the holiday. From the south end of the square you can continue your walk on the famous Váci pedestrian shopping street which is packed with fancy boutiques, shops, cafes, and restaurants. Apart from the highly commercialized aspect of the street, you’ll find some remarkable architecture in the area. So don’t just window-shop, scan the building facades occasionally, and you’ll spot some real gems. 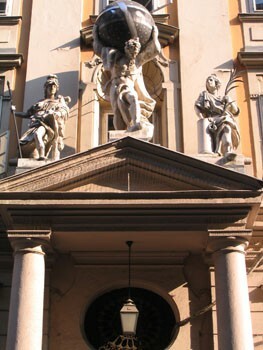 For instance, the facade of the building at No. 11 is decorated with beautiful Zsolnay tiles. Turn into Kristóf tér where a delicate statue of the Fountain of the Fishmonger Girl (A halárus lány kútja) stands erected by the Pest city’s Guild of Fishermen. 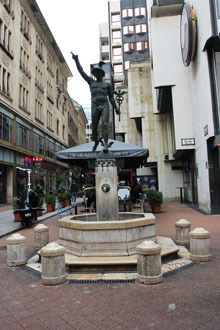 Another nice statue is the Fountain of Mercury (Hermész kút) on the corner of Régiposta utca. It’s a replica of Giovanni Bologna’s “Flying Mercury” in Florence. 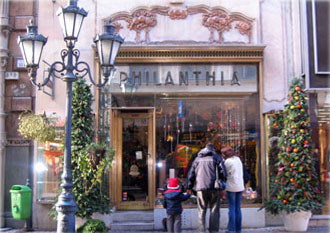 The Philantia flower shop at No. 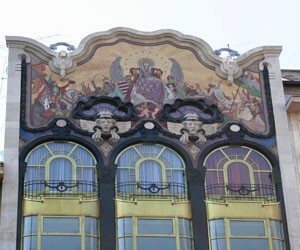 9 with its art-nouveau decor is another interesting building and shop in Váci utca. If you continue walking south you’ll find a small Baroque church, the Church of St. Michael (Váci utca 47/B.) that hosts organ concerts on a weekly basis. Cafe Stop: There’s a Waffle Bar just a few steps from the church, where you can gorge on luscious waffles with various toppings. They also serve Nespresso coffee drinks. In Szervita tér the Baroque Szervita church welcomes those who long for some quite moments. The stained glass facade with a huge mosaic picture on the house at No. 3 will caught your eye. Miksa Róth, one of the most outstanding stained glass artists of the time, created the incredible mosaic artwork titled the “Birth of Hungaria” on the building of the former Turkish bank. Walk along Petőfi Street that flanks Szervita tér, and you’ll reach the City Hall. (9-11., Városház utca). Built between 1716-1741 the Baroque building’s original purpose was to provide shelter for those who became crippled in the war between Austria and the Turkish army. 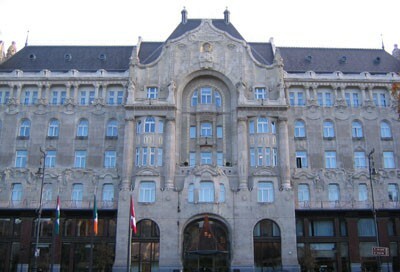 The building has been housing the Municipality of Budapest and been functioning as City Hall since 1894. Detail of the City Hall’s baroque facade designed by Anton Erhards Martinelli: Atlas, the God from Greek mythology holding the sky on his shoulders. 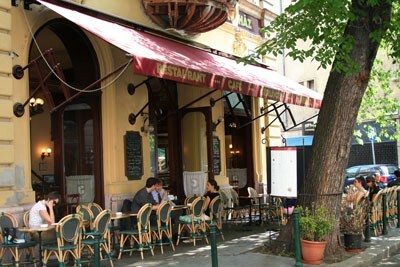 Városháza utca takes you to a charming inner city plaza, Kammermayer Square with the very Parisian-atmosphere Gerlóczy cafe on its side where you can take a rest and have lunch. if you feel like continuing walking, and exploring more of the central areas then the former Jewish district with the Central Synagogue in Dohány utca is at just a stone’s throw from here. If you had enough walking, and want to return to your hotel room you can get on the blue metro at Ferenciek tere or on any of Budapest’s three metro lines on Deák tér. TIP: If you feel like you can see Budapest on running tours lead by trained runners who love to share their running passion and insider knowledge about the city’s sights, history, and urban legends. Segway Tours – Fun Sightseeing! 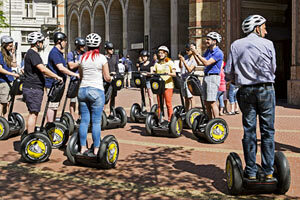 Find out about the city’s most important landmarks, history and culture on fun and inventive vehicles: the Segway. No special skills are required! Glide along Pest city centre in 1 hour with professional guides and Segway instructors. + 15-20 minute training is included along with safety helmets, and plenty of stops to take photos. You can choose from two walk tours of different lengths to explore the history, culture and most important sights of Jewish Budapest. The tours are held in English by professional guides. 01. May – 31. October: Monday – Thursday at 10.00 and at 14.00, Fridays at 10.00, Sundays: at 10.00, no tour on Saturdays and Jewish religious holidays. 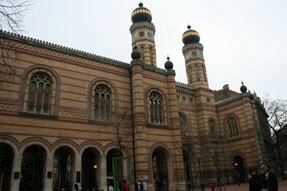 You will discover the monuments and sights in the former Jewish district. 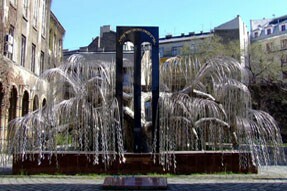 Includes an interior visit of three synagogues including the Dohány Street Synagogue, the Jewish Museum, the Holocaust Cemetery, the Raoul Wallenberg Memorial Park, Heroes’ Temple, the Emmanuel Tree of Life, Carl Lutz Memorial, Gozsdu Court, Madách Square, and other places in the historic Jewish Quarter. A coffee with cake at the end of the tour is also included in the price. Explore Buda castle by walk: two route suggestions. For more tips on what to see in downtown, read our page about Budapest city centre. See also our detailed list of the most popular attractions. The New Main Street between Kálvin tér and Szabadság tér is a great place for a walk, and to have coffee and snacks in of the many cafes in the area. See also our page about a nice walk in North Buda. 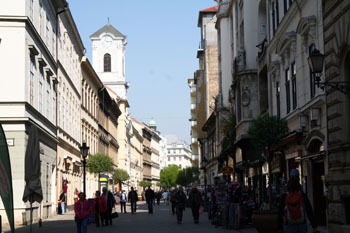 Andrássy Avenue with its fine buildings, cafes and restaurants is also an excellent place for strolling. TIP: See More Budapest Tours or Go to Sightseeing in Budapest.